Kallistos Ware (born Timothy Richard Ware, 11 September 1934) is an English bishop and theologian of the Eastern Orthodox Church. He has held since 1982 the titular Bishopric of Diokleia (made a titular metropolitan bishopric in 2007) under the Ecumenical Patriarchate of Constantinople. Metropolitan Kallistos is one of the best-known contemporary Eastern Orthodox hierarchs and theologians. 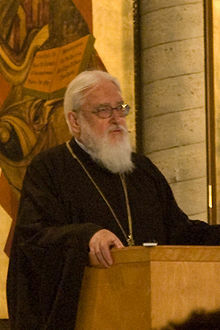 From 1966 to 2001, Metropolitan Kallistos was Spalding Lecturer of Eastern Orthodox Studies at the University of Oxford. Born Timothy Richard Ware in 1934 to an Anglican family in Bath, Somerset, England, he was educated at Westminster School in London (to which he had won a King's Scholarship) and Magdalen College, Oxford, where he took a double first in classics as well as reading theology. On 14 April 1958, at the age of 24, he embraced the Orthodox Christian faith. He describes his first contacts with Orthodoxy and the growing attraction of the Orthodox Church in an autobiographical text entitled "My Journey to the Orthodox Church." While still a layman, he spent six months in Canada at a monastery of the Russian Orthodox Church Abroad. Thoroughly conversant in modern Greek, Ware became an Orthodox monk at the Monastery of Saint John the Theologian in Patmos, Greece. He also frequented other major centres of Orthodoxy such as Jerusalem and Mount Athos. In 1966 he was ordained to the priesthood within the Ecumenical Patriarchate and was tonsured as a monk, receiving the name "Kállistos". In 1966, Fr Kallistos Ware became Spalding Lecturer at the University of Oxford in Eastern Orthodox studies, a position he held for 35 years until his retirement. In 1970, he was appointed to a fellowship at Pembroke College, Oxford. In 1982 he was consecrated to the episcopacy as an auxiliary bishop with the title Bishop of Diokleia in the Archdiocese of Thyateira and Great Britain of the Ecumenical Patriarchate. Following his consecration, Bishop Kallistos continued to teach at the University of Oxford and served in the Greek Orthodox parish in Oxford. On 30 March 2007, the Holy Synod of the Ecumenical Patriarchate elevated the Diocese of Diokleia to a metropolitan diocese and Bishop Kallistos to the rank of Metropolitan. Since his retirement in 2001, Metropolitan Kallistos has continued to publish and to give lectures on Orthodox Christianity. He served as chairman of the board of directors of the Institute for Orthodox Christian Studies in Cambridge, and is chairman of the Friends of Orthodoxy on Iona (Scotland) and of the Friends of Mount Athos. In 2017, Metropolitan Kallistos was awarded The Lambeth Cross for Ecumenism by the Archbishop of Canterbury "for his outstanding contribution to Anglican-Orthodox theological dialogue". Metropolitan Kallistos is a prolific author and a popular lecturer throughout the world. He has authored or edited over a dozen books, numerous articles in a very wide range of periodicals, essays in books on many subjects, as well as providing prefaces, forwards or introductions to many other books. He is perhaps best known as the author of the book The Orthodox Church, published when he was a layman in 1963 and subsequently revised several times. In 1979 he produced a companion volume, The Orthodox Way. He has collaborated in the translation and publication of major Orthodox ascetic and liturgical texts. Together with G. E. H. Palmer and Philip Sherrard, he translated the Philokalia (four volumes of five published as of 2018[update]); and with Mother Mary he produced the Lenten Triodion and Festal Menaion. St Vladimir's Seminary Press published a Festschrift in his honour in 2003: Abba, The Tradition of Orthodoxy in the West, Festschrift for Bishop Kallistos (Ware) of Diokleia, eds. John Behr, Andrew Louth, Dimitri Conomos (New York: SVS Press, 2003). For a more complete bibliography of Metropolitan Kallistos's articles, introductions, forwards, prefaces, obituaries and other publications than those indicated below, see OrthodoxWiki: . The Orthodox Church (1st ed. Pelican, 1963; 2nd ed. Penguin, 1993 ISBN 0-14-014656-3); 3rd. ed., Penguin, 2015 ISBN 978-0141980638). Eustratios Argenti: A Study of the Greek Church under Turkish Rule (Clarendon, 1964, ASIN B0006BMI94; reprint with a new Introction, Wipf and Stock, 2013 ISBN 978-1625640826)). The Festal Menaion (translated with Mother Mary) (Faber & Faber, 1977 ISBN 978-1878997005)). (Editor with Colin Davey), Anglican–Orthodox Dialogue: The Moscow Statement Agreed by the Anglican–Orthodox Joint Doctrinal Commission 1976 (London: SPCK, 1977 ISBN 978-0281029921)). The Lenten Triodion (translated with Mother Mary) (Faber and Faber 1978; St. Tikhon's Seminary Press, 2002 ISBN 1-878997-51-3). The Philokalia: The Complete Text (translated with G. E. H. Palmer and Philip Sherrard. London: Faber and Faber. Vol. 1, 1979 ISBN 0-571-11377-X; Vol. 2, 1982 ISBN 0-571-15466-2; Vol. 3, 1986 ISBN 0-571-17525-2; Vol. 4, 1999 ISBN 0-571-19382-X. The Orthodox Way (Mowbray, 1979 ISBN 0-264-66578-3). Communion and Intercommunion: A Study of Communion and Intercommunion Based on the Theology and Practice of the Orthodox Church (Light & Life, 1980; rev.ed. 2002 ISBN 0-937032-20-4). The Power of the Name - The Jesus Prayer in Orthodox Spirituality (SLG Press, 1982 ISBN 978-0551016903). Praying with Orthodox Tradition (Abingdon, 1990 ISBN 0-281-04431-7). How Are We Saved? : The Understanding of Salvation in the Orthodox Tradition (Light & Life, 1996 ISBN 1-880971-22-4). The Ordination of Women in the Orthodox Church (with Elisabeth Behr-Sigel)(Geneva: WCC Publications, 2000 ISBN 978-2825413364). The Inner Kingdom: Collected Works, Vol. 1 (St Vladimir's Seminary Press, 2000 ISBN 0-88141-209-0). Orthodox Theology in the Twenty-First Century (Geneva: World Council of Churches, 2012 ISBN 978-2825415719). “Review of Panagiotis N. Trembelas, Dogmatique de l’Église orthodoxe,” Eastern Churches Review 3, 4 (1971), 477-480. “God Hidden and Revealed: The Apophatic Way and the Essence-Energies Distinction,” Eastern Churches Review 7 (1975). “The Debate about Palamism,” Eastern Churches Review 9 (1977). “Wolves and Monks: Life on the Holy Mountain Today”, Sobornost 5, 2 (1983). “Athos after Ten Years: The Good News and the Bad”, Sobornost 15, 1 (1993). “Through Creation to the Creator,” Third Marco Pallis Memorial Lecture, Ecotheology, 2 (London: Friends of the Centre, 1996) <www.incommunion.org/2004/12/11/through-creation-to-the-creator> (12.03.2011). “Dare We Hope for the Salvation of All?” Theology Digest, 45.4 (1998). Reprinted in The Inner Kingdom (Crestwood, NY: St. Vladimir's Seminary Press, 2001). “Man, Woman and the Priesthood of Christ,” in Thomas Hopko, ed., Women and the Priesthood (Crestwood, NY: St Vladimir’s Seminary Press, revised edition, 1999). “God Immanent yet Transcendent: The Divine Energies according to Saint Gregory Palamas” in Philip Clayton and Arthur Peacocke, eds., In Whom We Live and Move and Have Our Being: Panentheistic Reflections on God's Presence in a Scientific World (Grand Rapids, MI: Eerdmans, 2004) (ISBN 978-0-8028-0978-0). “Sobornost and Eucharistic Ecclesiology: Aleksei Khomiakov and His Successors,” International Journal for the Study of the Christian Church 11, 2-3 (2011). “Orthodox Theology Today: Trends and Tasks,” International Journal for the Study of the Christian Church 12, 2 (2012). Introduction: Bishop Ignatius Brianchaninov, The Arena: An Offering to Contemporary Monasticism, trans. by Archimandrite Lazarus Moore (Madras, 1970), iii-xvi. Introduction: John Climacus, The Ladder of Divine Ascent (New York NY: Paulist Press, 1982), 1-70. Edited with George Every and Richard Harries: Seasons of the Spirit: Readings through the Christian Year (London: SPCK, 1984), x + 259pp. ; US edition: The Time of the Spirit (St Vladimir’s Seminary Press). Introduction: Marc le Moine, translated by Soeur Claire-Agnes Zirnheld, Spiritualite Orientale, 41 (Abbaye de Bellefontaine, 1985), ix-li. Preface: George Maloney, Pseudo-Macarius: The Fifty Spiritual Homilies and the Great Letter (Mahwah, New Jersey: Paulist Press, 1992), pp. xi-xviii. Foreward: Journals of the Priest Ioann Veniaminov in Alaska, 1823-1836, trans. by Jerome Kisslinger, ed. by S. A. Mousalimas (Fairbanks: University of Alaska Press, 1993), ix-xi. Foreward: Dumitru Staniloae, The Experience of God, trans. Ioan Ionita and Robert Barringer (Brookline, MA: Holy Cross Orthodox Press, 1994), ix-xxvii. Foreward: David and Mary Ford, Marriage as a Path to Holiness: Lives of Married Saints (South Canaan, PA: St. Tikhon’s Seminary Press, 1994), ix-xii. Foreward: Mother Thekla, The Dark Glass: Meditations in Orthodox Spirituality (London: Harper/Collins (Fount), 1996), v-vii. Introduction: Nikolai Velimirovic, Bishop of Ochrid, Homilies, vol. I"", translated by Mother Maria (Rule) (Birmingham: Lazarica Press, 1996), v-vii. Foreward: Donald Nicoll, Triumphs of the Spirit in Russia (London: Darton, Longman and Todd, 1997), ix-x. Foreward: Barbara Pappas, The Christian Life in the Early Church and Today according to St Paul’s Second Epistle to the Corinthians (Westchester, Illinois: Amnos Publications, 1998), ix-xi. Introduction: Philip Sherrard, Christianity: Lineaments of a Sacred Tradition (Brookline, MA: Holy Cross Orthodox Press, 1998), ix-xiv. Foreward: Columba Graham Flegg, An Introduction to Reading the Apocalypse (Crestwood, NY: St. Vladimir’s Seminary Press, 1999), vii-viii. Foreward: Elisabeth Behr-Sigel, Lev Gillet (Oxford: Fellowship of St. Alban and St. Sergius, 1999), 9-13. Preface to Alphonse and Rachel Goettmann, Priere de Jesus: Priere du Coeur (Paris: Albin Michael, 1999), II-21. Foreward: The Blackwell Dictionary of Eastern Christianity (Oxford: Blackwell Publishers, 1999), viii-ix. Foreward: Emil Bartos, Deification in Eastern Orthodox Theology. An Evaluation and Critique of the Theology of Dumitru Staniloae (Carlisle: Paternoster Press, 1999), ix-x. Foreward: Hilarion Alfeyev, The Spiritual World of Isaac the Syrian, (Kalamazoo, Michigan: Cistercian Publications, 2000), 9-13. Foreward: John Chryssavgis, Soul Mending. The Art of Spiritual Direction (Brookline: Holy Cross Orthodox Press, 2000), ix-xi. Foreword: 'Being Human' The Wheel, issue 13/14 (Arlington, Maryland, 2018), 6-10. ^ "ROCOR's Emphasis On Ascetic and Liturgical Tradition is Very Much Needed Today". Retrieved 6 May 2018. ^ "The Archbishop of Canterbury's Awards: Citations in Alphabetical Order" (PDF). Archbishop of Canterbury. 9 June 2017. Archived from the original (pdf) on 19 June 2017. Retrieved 14 July 2017. Foreword to issue 13/14 of 'The Wheel' journal, entitled "Being Human"